I’m about to settle into a few hours of Super Bowl watching, but first wanted to share the next project in the Showy Garter eBook. Zephyr Cove is a DK-weight scarf with contrasting neutral and deep colors stripes that run perpendicular to asymmetric Showy Decrease lines. Some projects are inspired by the yarn and that was certainly the case here. I saw this Acadia yarn from The Fiber Company in a shop in Boulder when visiting my daughter, Jackie. 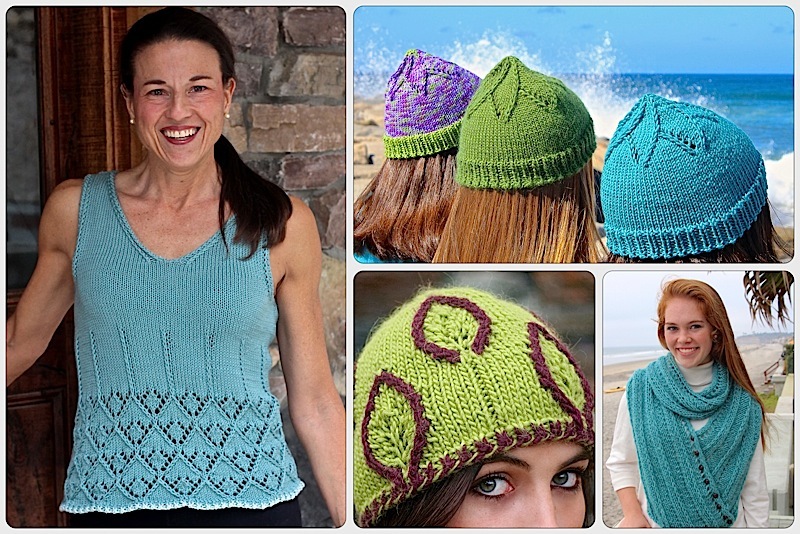 I blogged about Boulder’s two knitting shops last year. They were just stocking the shelves with this new yarn and I was immediately attracted to the sophisticated colors. Once I picked up a skein of this merino, alpaca and silk blend it was all over. I mean really, who could resist? I just needed the yarn to tell me what it wanted to be and this project was perfect for it. It’s hard to pick yarn colors that show all the details when photographed. Well, it’s not actually difficult, I find medium greens and blues work best, but I’d love to show you other options. This design works well with deep tones since they still pop off the alternating cream stripes. As you can see there are many options with this concept of two neutrals and two deep colors. Shown to the right are some ideas for soft colors, bold warm colors or calming cool colors. Zephyr Cove is not any more difficult that the Rubicon Bay scarf since the Showy Decrease lines start at the bottom and continue the entire length of the scarf. We’ve just mixed things up a bit with Showy Decreases lines that go from narrow to wide and a varied stripe pattern. Here’s a closer look at the stripe repeat. Half the yarn is cream with the other half split pretty evenly between the 3 contrasting colors. The pattern includes more details. If you are new to the blog and our ‘Nuances’ you’ll want to get caught up on the Showy Decrease and some of our other techniques. We’ve organized the blog categ ories to make this easier and don’t forget to stop by our website for a list of free patterns that demonstrate these ideas. This entry was posted on February 5, 2017 by Laura Cunitz in Free Downloads, Nuances, Patterns, Scarves, Showy Garter.